Mens Aubin And Wills Wool Jacket Green Size Medium. Condition is used so there is a little bobbling but this is the nature of the material as it is a tweed type of cloth. 100% pure wool in a millennium window pane check tweed made in UK 2000. chest pocket & buttonhole.single back vent.each cuff finished with 4 buttons. top shoulder seam-cuff 25". top of shoulder seam -seam across back 19". Moss green wool with blue and brown check, and crimson lining featuring various hunting motifs. It is a classic high break three button slim tailored jacket in excellent quality worsted with a rich blue lining. The suit cost about £1,000, so it is excellent quality even though it is old. Be aware, these were slim fit designs, so although it is around 42" chest it is cut to fit snugly. HARRIS TWEED JACKET BLAZER. 100% authentic or your money back. M&S COLLECTION MANS WOOL JACKET ABRAHAM MOON TAILORED Size40 MED BNWT!! Mens Canali Dark Navy Blue blazer jacket Size L - 50 Reg. Wool Excellent Cond. Condition is Used. Dispatched with Royal Mail 1st Class. Brand new with tags Next signature super fine Italian wool with a beautiful quality lining RRP £120 I have taken some indoor & outdoor pictures for a better idea of its natural colour..
New listingGents Jacket Size38LONG BNWT pure New Wool M&S Abraham Moon BNWT STUNNING ON!!! Its shell is made of 100% wool and its lining is made of 100% rayon. Three buttons to fasten in the front. Buttons on the cuffs. Excellent quality and beautifully made and finished. Overall, in excellent condition but there are small holes on the back (see pictures). Paul Smith Jacket. Grey. 100% Lightweight Wool. 2 Button Fastening. Size 40. Striking 2 button cut. Fab quality that would work for smart or casual wear. ALLSAINTS SPITALFIELDS 100% WOOL NAVY BLAZER JACKET 44"
New listingMens Tailored Tweed Sports Jacket Size R 40. 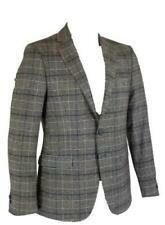 Mens Tailored Tweed Sports Jacket Size 40R slim fit. Never wore but tags removed. 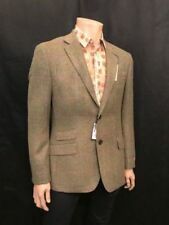 Mens Marks And Spencer Tweed Wool Jacket 40” Medium in excellent condition. Luxury jacket with Moon tailoring- see labels in photos. Colour on care label is “Green mix”. 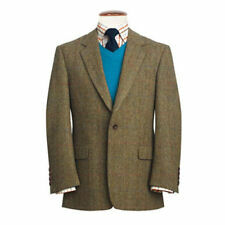 See photos for the mix of colours in this lovely Yorkshire tweed jacket. ( hard to capture the exact colour but best photo of it is no. 9). Measurements can be provided on request. This is too neat on me now, so selling. Smoke free home. Any questions please ask. HARRIS TWEED mens CLASSIC BROWN HERRINGBONE SPORTS JACKET BLAZER 40"
Superb quality Harris tweed sports jacket, in a classic brown herringbone, buggy lined, single breasted football button front and back centre vent. accessories are for display purposes only. ( I am sad it has to go but it wasted just hanging in the wardrobe ). 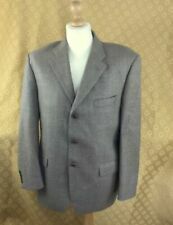 White stuff mens grey wool/tweed blazer large. Fully lined in striped fabric. Condition is Used. Dispatched with Royal Mail 1st Class. TM Lewin Mens Jacket/Blazer - Charcoal/Dark Grey and Light Blue Windowpane Check. Size S (36/38) - Regular. 100% Wool.Condition is lightly used - very good condition. All buttons intact. Despatched via Royal Mail 2nd class or collection (central London). Delicate Herringbone Pattern With Check Overlay - Brown With Fine Red Check. Interior Is Lined In Brown With Herringbone Style Pattern. Twin Vent To Rear. In Immaculate Condition. Breast Pocket. It is made of heavy wool and is navy in colour with chalk white stripes. It goes beautifully with a pair of jeans or chinos. The blazer is unaltered and in near new condition. I only wore it once last winter. Single breasted, green with Red overcheckall wool finish. SIZE: MARKED 46, WOULD SUIT 44" CHEST TOO. PIT-2-PIT 23”. SLEEVE LENGTH 26”. SHOULDER EDGE TO EDGE 19”. CONTRAST RED PKT LINING. FULL LINING. HARRIS TWEED mens ROY ROBSON BLUE RUSTIC CHECK WEAVE SPORTS JACKET BLAZER 42"
Superb quality Harris tweed sports jacket, in a classic blue weavewith rustic over check, single breasted with three football buttons. Jack Wills navy wool blazer with pink under collar. Size Large which my husband thinks corresponds to a 40 chest but please do check the Jack Wills website to be sure. There is a small rip in the lining - see photos. Otherwise very good condition. Country Tweed Hunting Shooting Hacking Norfolk. Brown Herringbone. Stylish Sports Jacket Blazer Coat. 100% Pure New Wool. Twin Vents. Brown Fabric Under Collar. Size Label - UK Chest 40" S. Across Chest (Underarm to Underarm) - 21". Harris Tweed Blazer 42R. Wonderful Harris Tweed blazer in an amazing weave in a vibrant mix of brown's to create a fantastic quality fabric (see close up photos). This blazer has brown leather buttons, 2 slit pockets, buttoned storm tab,4 inside pocket and a sumptuous brown lining. Harris Tweed Blazer 42R. Wonderful Harris Tweed blazer in an amazing weave in a mix of brown, green, white and tan to create a fantastic quality fabric (see close up photos). This blazer has tan brown buttons, 2 flap pockets, 4 inside pocket and a sumptuous brown lining. JACKET : Single breasted with two (2) button front which is repeated at the 4 X working cuffs ( all buttons present) 2 ticket pocket front, a breast pocket. It is fully lined in a luxury deep vibrant light grey coloured lining, very cool, with 3 internal pocket. A versatile navy blue blazer from Gieves & Hawkes of No. 1 Savile Row. Nice brass buttons. Barely worn, in terrific shape. Back, from collar to hem - 31.5". Sleeve, from shoulder to cuff - 26". HACKETT PURE WOOL TWEED MEN'S JACKET OF VERY HIGH QUALITY. SHOULDER TO SHOULDER 18 INCHES,AMPIT TO AMPIT 20 INCHES,UNDER COLLER TO HEM 31 INCHES AND SLEEVES SHOULDER TO CUFF 24 INCHES. MADE IN UNITED KIMGDOM. Single breasted, green all wool finish. SHOULDER EDGE TO EDGE 18”. SLEEVE LENGTH 27”. CONTRAST PINK UNDERCOLLAR. JKT LENGTH 30”. PIT-2-PIT 20”. SIGNATURE BUTTONS. SINGLE VENT. Harris Tweed Blazer 40R. Wonderful Harris Tweed blazer in an amazing weave in a mix of brown, grey and blue to create a fantastic quality fabric (see close up photos). This blazer has grey horn style buttons, 2 flap pockets, 4 inside pocket and a grey lining. HarrisTweed Wool Men's Jacket Size 44"
Harris Tweed Wool Men's Jacket Size 42"
HarrisTweed Wool Men's Jacket Size 42"
Harris Tweed Wool Men's Jacket Size 40"